An urban house for rent. After a trying search, Jacob Butula has finally found a place to rent in Vancouver. But the apartment on the top floor of a house is far from ideal. Only a sheet separates his room from the living room that he will soon share with three roommates. One roommate has promised to build him a makeshift wooden wall to replace the sheet. But it still means everyone living there will have easy access to his room. "It's a sacrifice I'm making for affordable rent," he adds, as he moves to Vancouver to finish a master's degree in counselling psychology and complete his practicum. For now, he believes a temporary wall may be as good as it gets with his $750 a month rent limit. According to Canada Mortgage and Housing Corporation's spring rental market survey, the vacancy rate in greater Vancouver now sits at less than half the national average for large centres. It declined to 1.4 per cent in April 2015 from 1.8 per cent a year earlier. At the same time, the average rent on a two-bedroom unit jumped 3.4 per cent to $1,345 a month — the highest rent in the country. The situation isn't much better in the Toronto region, which had a rental vacancy rate of 1.8 per cent in April, down from 1.9 per cent in April 2014. The average rent for a two-bedroom also jumped 1.8 per cent to $1,269. And the situation could get worse. A recent TD Economics report noted that due to escalating home prices in the Greater Toronto Area, it's expected more people will choose to rent, leading "to a further tightening supply in the rental market." 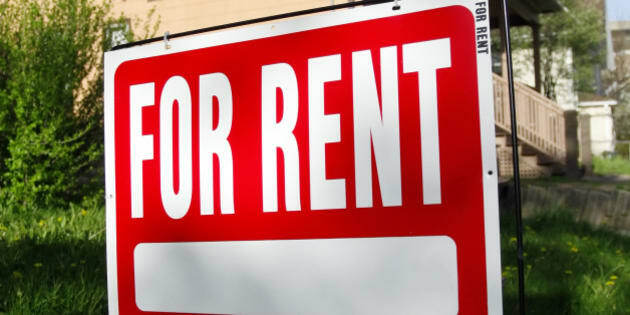 A July report by realtor David Goodman concluded that a shortage of rental stock and unprecedented demand in and around Vancouver are creating the perfect storm for a "rent increase tsunami." As for Butula, all he wanted was to rent a room in a house. But he found even that was a challenge. "It's a little ridiculous," he says. When he started his search, he says he answered more than 30 online rental ads and had only two responses. He also posted his own ad, which led to just two more responses. And by the time the grad student had taken the ferry from his current home in Victoria to Vancouver, he discovered the first rental he had booked to see had already been snapped up. The second place he saw didn't pan out either. The first thing the landlord did was hand him a page-long list of house rules that included no overnight guests. "At this point, I'm like, this is too weird for me. I'm out, thank you." He also gave up on the third location because the landlady suggested he couldn't have guests for at least the first two months. So when Butula finally scored the room with a makeshift wall, he decided "it's good enough and I'll make it work." Real estate expert John Andrew says there are quality rentals available in hot real estate markets, Toronto and Vancouver — if you're willing to pay a premium price for a condo. "If you can afford the $2,000 a month, which is pretty typical for a one-bedroom [condo], you're fine," says the Queen's University professor. Andrew says condos make up a majority of Toronto's new rental supply because they're a more lucrative investment than apartment buildings. "There's no way for developers to make money building traditional rental apartments. There's very few of those being built. It's so much easier to make money with condominiums," he says. But the surge in condo development means slim pickings for renters on a tight budget, including those trying to save for a first home. "For those people who can't afford [condo rents], it is really, really competitive and very difficult," Andrew says. Munib Sajjad decided it was impossible for him. He works full time as the executive director of the University of Toronto Students' Union, but he is also saddled with student loan payments. Unable to afford to rent a place near his work at the university's Mississauga campus, he instead lives with his parents in Scarborough. He spends about three hours a day commuting to and from work. The situation "gets to be really troublesome, very, very frustrating," says 26-year-old Sajjad. He says he knows several recent university grads who want to pursue careers in Toronto, but are hampered by the city's high rent prices. "It's absurd, it's so inaccessible for anyone that wants to find a new job or new beginnings." Professor Andrew says cities like Toronto and Vancouver would probably need assistance from the federal government to offer more affordable rentals. "Unless there was some sort of a federal affordable housing mandate, that's about the only thing that would address this, where you're subsidizing the construction of rental housing," he says. But he adds that he doesn't think that's going to happen. "Now we're into a federal election campaign and we're not hearing any [politician] talking about that." Andrew says, instead, what may help struggling renters down the road is if the soaring condo construction in places like Toronto and Vancouver eventually turns into a condo glut. "If [a condo rental] sits there empty for months, sure they're going to lower the rent, it will certainly help," he says. But, he adds, "We're really not seeing that happening yet."